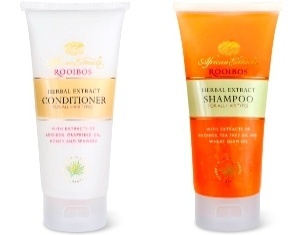 The African Extracts Rooibos range of skin and body care products is a South African success story, and now there is great shampoo and conditioner to add to their selection. African Extracts Herbal Shampoo is made from a patented Rooibos extract and is enriched with tea tree and wheat germ oil. Rooibos is a well known endemic plant to South Africa renowned for its anti-oxidant properties, while tea tree oil has anti-fungal and anti-bacterial properties which help to keep your hair and scalp healthy.Wheat germ oil is an excellent emollient, relieving dryness and adding softness to the hair. The shampoo gently cleanses without stripping the hair of natural oils and is ideal for every-day use. The herbal conditioner has a combination of natural extracts (including Rooibos) that protect your hair against environmental stress and pollutants. Seaweed extracts provide a wide variety of vitamins, minerals and amino acids to strengthen hair and improve strength and elasticity. Grapeseed oil is included for its ability to absorb quickly and moisturise without adding weight to the hair. Three lucky readers can each win a shampoo and conditioner. Please send an email to melissa@lifeinbalance.co.za with the email title African Extracts to be included in the lucky draw. Please note only one entry per email address and that winners are chosen via a random lucky draw. Your details are not shared for any other purpose other than to facilitate the winner’s receiving their gifts. Entries close on the 27th December 2013. Available from Dis-Chem and pharmacies countrywide.